In 2018, Rishi Bagaria was promoted from analyst to junior partner and director at Thessalus Capital. Bagaria started working as an analyst at Thessalus Capital, which was founded by his older brother and family friends, in 2015, when he was a 15-year-old eighth grader. Perhaps a “shooting star” would be more apt. Bagaria’s rise to success has been remarkably quick — and he isn’t even out of high school yet. Today, at 18, Rishi Bagaria takes five honors classes at The Lawrenceville School in N.J., is president of the both the investment and debate clubs at his high school, co-editor of a student magazine and an award-winning member of Model United Nations. He also likes to play golf, work out, hang out with his friends, play board games and watch Indian movies with his family. Neither of Bagaria’s parents, who emigrated from India, are involved in finance. His mother, Suman, is a holistic healer. His father, Sunil, founded a recycling and sustainability business. Bagaria was first introduced to investing by his uncle, Surendra Bagaria. “Whenever we would go over for dinner or Thanksgiving, when I was around 10, my uncle would pull me and my older brother aside and tell us about stocks he was investing in, how cool the market was and what opportunities there were,” Bagaria tells CNBC Make It. And he always sought out ways to learn more. “The first book I read was, ‘Investing for Dummies,’ because … I didn’t know anything,” Bagaria says. He also took a financial literacy class in middle school. Bagaria’s brother Raj, who is 20, was also interested in investing. So their father helped them set up virtual stock market account. “My dad wanted us to treat it like a real account, so we had to do proper research. We had to handle it like it was actual money,” Bagaria says. In eighth grade, Bagaria’s father gave him $2,000 to invest in stocks. First, Bagaria bought “blue chips stocks,” like Apple and AT&T. “I didn’t want to be too risky,” he says. Bagaria’s parents encouraged their sons to try new things. “When they said, ‘Dad, should I do this?’ I’m like, ‘Okay, try it,” Sunil tells CNBC Make It, adding that, at the very most, they would fail and be able to learn from their mistakes. Raj (left) and his brother Rishi Bagaria. Photo courtesy Rishi Bagaria. Sunil and Suman’s friends, the Ngs, had two sons, Mitchell and Kenneth, who were also interested in investing. 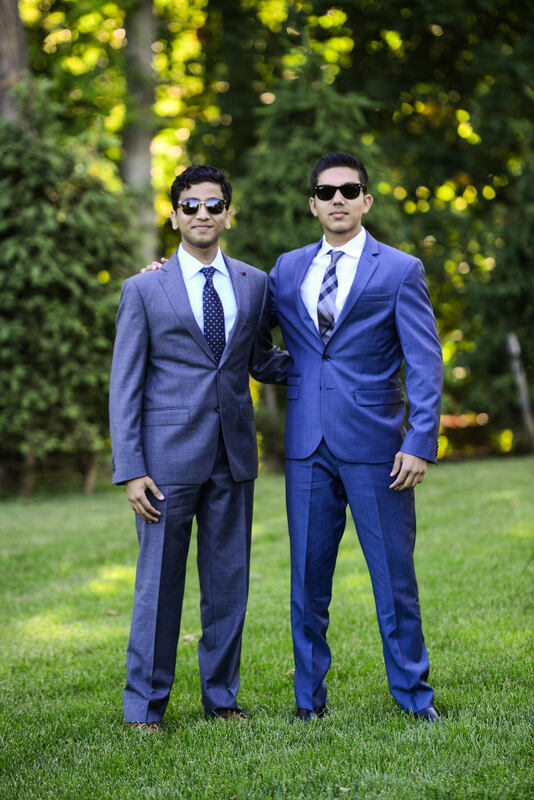 The Ng brothers were thinking about putting together an intercollegiate investment club, and they asked the Bagaria brothers to help them start it. In 2015, the Ng brothers and Raj launched Thessalus Capital, which invests its clients’ money in healthcare companies in order to make money. The firm is so-named after a physician from Ancient Greece. Thessalus Capital functions as a company, but is a club for tax purposes, says Bagaria. The young financiers focused on healthcare companies because that’s what they know most about. “It’s our area of expertise,” Kenneth Ng, 27, tells CNBC Make It. Mitchell and Kenneth, both 24, are medical students and most of Thessalus’ investors and advisors are physicians or healthcare investors. And Raj and Rishi’s unclde was himself a doctor. The investment company was launched in Princeton, N.J., with $370,000 in seed funding, according to an October 2018 pitch deck reviewed by CNBC Make It. Of that, $150,000 came from the brothers’ parents and $220,000 was raised from outside investors who the young investors met “mainly through personal networks, including other physicians (i.e., cardiologists and orthopedic surgeons), people working in finance and personal friends,” says Kenneth. Brothers Kenneth (left) and Mitchell Ng are managing directors of Thessalus Capital. Currently, there are nine investors (including Rishi’s parents) and 15 total team members. The founding team recruited the team members from their personal networks of medical students and family members of investors. “As the firm grew, we got in touch with investment clubs and business fraternities at elite institutions like Princeton and Wharton for networking and recruitment of analysts. Most of our younger analysts are looking for early finance experience at a boutique fund” before they apply to work at large investment firms like JP Morgan and Goldman Sachs, explains Kenneth. Aside from Rishi, all the other team members are in college and grad school. Since being promoted to junior partner, Bagaria is now part of the upper management team, who decides on how to invest company cash. He also leads the analyst team and reviews their research and pitch decks before it gets presented to upper management. Rishi “provided great work and analyses” on two biotech companies in particular, Bluebird Bio and Sophiris Bio, says Kenneth. For all of the partners, Thessalus Capital is a side-hustle. Bagaria makes time for his work at Thessalus Capital between school assignments, as well as on the weekends. (He also makes it a priority read The Wall Street Journal and The Economist every morning, a tradition he started in sixth grade.) Fall term senior year was the “most stressful” for Bagaria because he was also juggling college applications. He plans to attend Georgetown in the fall and study Global Business. So far, Thessalus has been doing well. From October 1, 2017 through October 1, 2018, cumulative returns earned by Thessalus Capital were 41.7 percent, according to the investor pitch deck reviewed by CNBC Make It. By comparison, from October 1, 2017 through October 1, 2018, the benchmark S&P 500 Index rose 15.6 percent. Investors, like Bagaria’s parents, get paid dividends of 5 percent of total returns once per year in December, Kenneth tells CNBC Make It. Eventually, Bagaria says he would like to be able to pay his parents back for the tuition payments they have paid on his behalf. Previous Previous post: Elon Musk tweeted, then revised, Tesla financial guidance. He probably shouldn’t have.